The Award-Winning Hilton DFW Lakes Executive Conference Center hotel offers a spectacular retreat for work and play. 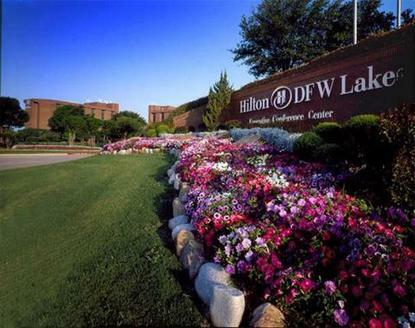 Located just five minutes from DFW International Airport in Grapevine, Texas, the Hilton DFW Lakes Executive Conference Center hotel combines certified executive conference facilities with scenic and serene surroundings amongst over 40 forested acres. Look no further for luxurious accommodations, dazzling event facilities, and a relaxing resort setting.The Hilton DFW Lakes Executive Conference Center hotel in Grapevine, Texas boasts of recently renovated guestrooms that exude an air of comfortable sophistication. Our guestrooms are designed to allow you to catch up on work while away from the office, rest from a day of sightseeing, and rejuvenate the mind. Plan the most successful meeting with ease and confidence knowing that the hotel exceeds the strict criteria required for membership in the International Association of Conference Centers.Hilton DFW Lakes Executive Conference Center Hotel Amenities The Lakes Sports Club, Outdoor and Indoor Swimming Pools and Jacuzzi Whirlpools, Fishing, Horseback riding trail rides at Austin Ranch, Outdoor tennis courts, Racquetball court, Sand volleyball, Basketball half-court, Jogging trails surrounding our private lake.Hilton DFW Lakes Executive Conference Center Hotel Features Complimentary 24-hour shuttle transportation to/from DFW International Airport, Kiosk available for pre-flight check in and flight information update, Prime central US location for National Meetings, 63,000 square feet of flexible meeting and event space, Austin Ranch offering the most unique venue for all events, Valet and self-parking, On-site restaurants and 24-hour room service, including Starbucks, High-Speed Internet Access, The Lakes Sports Club - a full service health and fitness facility at the Hilton DFW Lakes Executive Conference Center hotel, Full service business center.Plan your next escape from the ordinary and come the Hilton DFW Lakes Executive Conference Center hotel in Grapevine, Texas, centrally located to activities for all to enjoy. Shop the day away at downtown historic Grapevine for those one-of-a-kind finds or head to Grapevine Mills Mall for superior outlet shopping. Hit the links at several area golf courses including Cowboys Golf Club - the only NFL owned course or try your luck at a round of simulated indoor golf at Texas Indoor Golf. Catch a game at Rangers Ballpark in Arlington, Texas Stadium, or American Airlines Center or feel the engines roar at Texas Motor Speedway. Take a tasting tour of one of Grapevine's multiple award-winning wineries and then jump aboard the Vintage Railroad for an afternoon of sightseeing. Travel should take you places.